There is nothing like a harp. Nothing in this world, anyway. First, it is an exquisite work of art. But beyond its physical beauty is the music, rich and powerful, flowing from the strings. Your taste is unique and your music should be also. I have been privileged to provide musical memories to brides and grooms and beloved guests around the world. 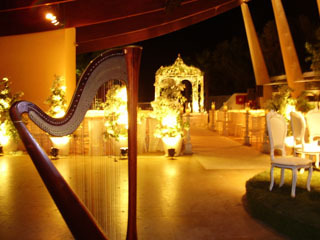 The harp can convey through music the essence of your love as a couple. The harp will make your gathering unforgettably beautiful and emotionally charged. It will hold you captive and at the same time set you free. I can play anything from the traditional "Here Comes the Bride" to the other extremes of your imagination. I am always open for new requests and can discuss your ideas, helping you decide on what would be best for your wedding or special occasion. Under good weather and over a sturdy surface, harp can be played outdoors and transported to remote locations. I have various types of harps and can provide amplification when necessary. Please do not hesitate to contact me with any questions or ideas you might have or use the contact page to check for availability. In the intimate setting of our chapel, Marina Roznitovsky, enchanted our congregation with her artistry at the harp. We scurry to our calendars to find new dates when she can return. "Marina made the music at my wedding so beautiful and memorable. I would highly recommend hiring her for any special occasion." Marina played at the mass and reception at my mother's outdoor 80th birthday party. We had given her music in advance. She played beautifully and looked angelic as well. We would definitely ask her to play again. Marina is an exquisitely talented professional harpist. She came highly recommended to us by two sources. Not only is Marina the consummate professional which was evident during our communication, she is also an elegant, beautiful lady. She presented herself at the wedding with poise and a refreshing calmness. I have and will continue to recommend Marina to anyone who wants to take their event to the level of gracefulness and class she is sure to deliver. She set a lovely tone to the wedding ceremony from the gathering music to the recessional. Our guests were delighted with her and her music. Her music was a key ingredient in the overall atmosphere of the ceremony, and it filled the air with a magical feel. She was prompt and organized. I have and will continue to recommend Marina to anyone who wants to take their event to the level of gracefulness and class she is sure to deliver. Marina, you and your beautiful harp have been great contributors to the Healing Arts Program at Renown Regional Medical Center. Your caring personality, your lovely music and your commitment to quality performances have made many patients, visitors and staff stop for a moment and appreciate a few moments of peace and tranquility. You are a gift to many. "Marina is the artist that we go to when we need to create an extra special mood for our guests. We always receive accolades for the extra step she takes to make each performance unique." Marina, I would just like to say "Thank You" so much for playing the harp for us. The sound was perfect and added so much to our party. Thanks for all your work. The harpist was EXCELLENT!!!!!!!!!!!!!!!!!!!!!!!!!!!! It was a pleasure to work with Marina and have her at our wedding. I will highly recommend her to anyone else that is in need of one. I also will recommend your service to everyone that I know. Should we need any musicians in the future, I will be in contact with you. Wow! What a beautiful performance you gave this morning at the Kelley School of Business. It added wonderfully to today's event. Thank you so much for working with us. Thanks for your work with the Wind Ensemble this semester. You are a delightful young woman and a talented and dedicated musician. I appreciate the seriousness of your approach to the music. I would certainly be delighted to have you play with my ensemble again next fall as we prepare for our performance in Chicago in December. I just wanted to say what a great job.... thanks again for the invitation. I really enjoyed your performance, which was wonderful - poised and graceful. It was my first experience of the harp, and I'm very impressed. I hope you enjoyed the recital as much as the audience clearly did. Q: What is the booking procedure? A: I can be contacted through the online form or by phone. Pending availability, I will then send you a reservation form via email (or standard mail, if you prefer) to be completed and returned. This will serve as a contract for the event in question. I can be consulted by phone or in person to discuss further details and musical choices. Q: How early (or late) can a booking be made? A: I generally accept bookings for up to a year in advance. While it is common practice to book an artist five to seven months prior to a big event, I realize that last minute situations can come up. I am happy to accept last minute reservations, provided I am available on that date. However, certain musical requests might not be possible on late notice (less than a month). Please use the "check availability" form; I will try my best to help you! Q: How long will you hold my reservation date? A: Your date is technically reserved after I send you the performer contract. You will then have two weeks to return a signed reservation form. I will always confirm the contract with you before responding to a new inquiry for the date in question. However, your initial inquiry of availability will not hold the date for you until I have received the reservation form and deposit. Q: What is the required deposit? A: Typically, the deposit is 50% of the full contract amount. It should be returned to me along with the performer contract form. This will secure your reservation. Q: What happens if the event is canceled? A: In the event of cancellation on the client's part, the deposit will be retained to compensate for holding the date. In the very unlikely event of cancellation on my part, I will accept responsibility to find a qualified substitute under the original contract terms. Q: Is it a problem if the event is outdoors? A: It is not a problem to play outside in comfortable weather. However, the harp is a very expensive and sensitive instrument and cannot be exposed to extreme conditions. Direct sun, very high or low temperatures, rain, humidity, and wind are factors to consider. In the case of direct sun, it may be necessary to arrange for adequate shade to protect the instrument. If there is a chance of rain it is always good to have an indoor location as a plan B (or at least a big enough tent or roof arrangement). Q: What kind of surface is necessary for your instrument? A: A dry, flat and sturdy surface is needed for placing the harp. The minimum playing surface is two and a half feet by four feet. A Harp cannot be placed on sand or loose gravel, or directly on grass and similar surfaces. Please ask me if you are still not sure about a surface requirement. Q: How difficult is it to move the harp? A: Often, the reception is just a short walk away from the ceremony location. The harp easily travels over pavement and similar surfaces using a special wheeled cart, which I handle myself. If there are stairs involved or if the surface is not suitable for the cart, the harp can be easily carried by two persons. For a more distant location, the harp can be loaded back into the "harp mobile," or almost any vehicle under my supervision. A: I have a large repertoire ranging from classical and celtic music to jazz, modern, and popular pieces. I'm always willing to discuss your preferences with you and find musical selections that will suit your taste. A: Yes! I am always happy to find or arrange a piece you love (this is how I keep my repertoire growing). Please keep in mind that not every piece will work on the harp, though few are actually impossible. I only ask that you try to get your requests in early so that I will have adequate time to prepare. Q: Can you arrange a chamber ensemble? A: There are plenty of options. Beautiful duet combinations of the harp with a stringed instrument, flute, voice, or any other desired instrument are available. If you want something even more special, a harp duet is a great choice. If you really want to knock them off their feet, a harp trio or quartet is also a possibility. If your nephew wants to sing a song accompanied by the harp, it is not a problem, provided I have the music in advance and am allowed a run-through before the performance. Please do not hesitate to contact me and discuss your ideas! Q: Do you use amplification? A: Normally, the harp carries through to a decent crowd of people, even on an outdoor event. However, sometimes it is just not loud enough to compete with loud crowds or large areas. If this is a big event, or an outdoor event on a windy day, it is recommended to have some amplification so that everyone can enjoy the music. If there is no DJ on the event that can provide sound, I will provide my own amplification.